Immunogen: Synthetic peptide corresponding to a portion of mouse Fas. 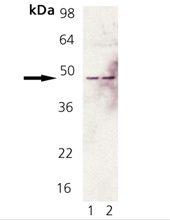 Scientific Background: Fas/APO-1/CD95 is a 36 kDa cell surface type I-membrane glycoprotein with an apparent molecular weight of 44 kDa on SDS-PAGE. Fas belongs to the tumor necrosis factor receptor (TNFR) family, which includes TNFR1, TNFR2, CD27, CD30 and CD40. Binding of Fas-ligand (FasL) to Fas or crosslinking of Fas by anti-Fas monoclonal antibodies leads to apoptosis of Fas expressing cells. Both Fas and TNFR contain a 70 amino acid cytoplasmic “death domain” responsible for transmitting signals for apoptosis. Apoptosis induced by Fas-Fas ligand interaction is inhibited by a number of cytosolic factors such as the ICE/CED3 family inhibitor CrmA, and the short and long forms of FLIP. Insertion of an early transposable element in intron 2 of the Fas gene, as in the mouse lpr mutations, causes lymphoproliferation and autoimmunity in mutant mice, suggesting the involvement of Fas in clonal deletion of autoreactive T cells. Western Blot Analysis of Fas pAb : Lane 1: Rat Brain Tissue Extract, Lane 2: Mouse Brain Tissue Extract. Immunohistochemical staining of human hepatoma tissue with Fas pAb.